The flavor of buttery caramel combined with lightly roasted coffee. So simple. So sweet. 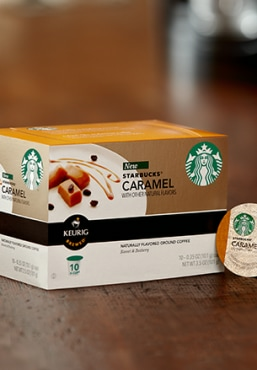 Caramel adds just the right touch of richness to every cup. Our blend of caramel flavor with a medium-roasted coffee creates moments to savor from the brewing aroma to the very last sip. Add some tasty fun to your cup before brewing: marshmallows, almond extract, or hot chocolate mix. Chocolate and other indulgent treats.